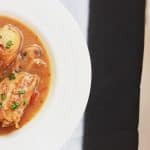 An easy, comforting chicken stew with simple flavours and an even simpler list of ingredients, for those times when you simply want food that satisfies. Makes weeknight dinners such a breeze! My husband and I have been stuck with the flu for a week now. And when that happens, you suddenly realize how limited your options for food are! We tried on some khichdi (an Indian spiced lentil and rice porridge) and some more khichdi and then some more, till we couldn’t have any more and got really bored of it. In between, we also had some soup and porridge and then repeated the whole thing all over again. I was kinda okay with the whole routine, but Denver couldn’t stomach it anymore. He needed to bite into some real food (read: meat). He’d had too much of all the sick food and needed to wake his taste buds up. Only problem was that we were still sick. So we decided to keep it light and basic with some chicken stew. Have some stew, when you got the flu. Said no one ever. I wonder why. We made some really simple stew and it kept us company for lunch and dinner. 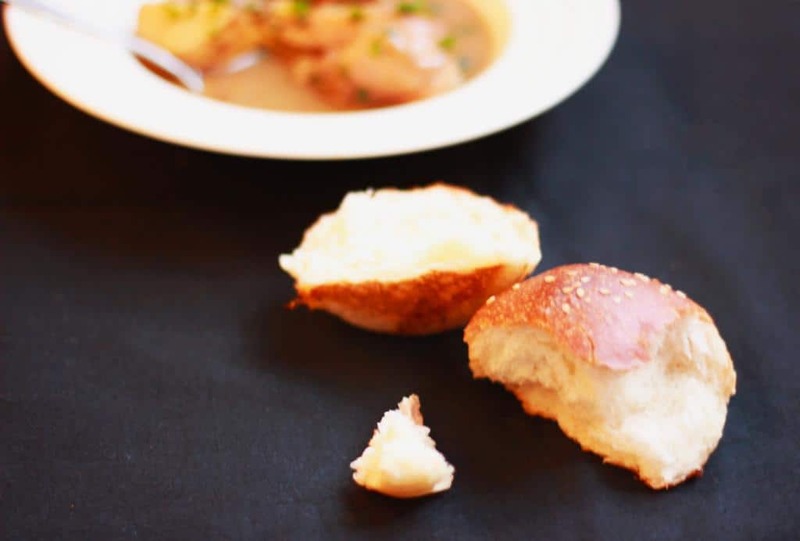 Its hearty, warm and filling and goes so well with bread, rice or chapati; whatever catches your fancy. It is perfect for when you’re under the weather and need a meal that lifts your spirit. There’s nothing that a good stew can’t cure and believe me, we were relieved of half the gloom that had taken over us, after having this. Its flavors are so simple and yet fulfilling for the stomach and the heart and can be enjoyed the same way when one is not sick! Like wine, it also gets better with age. I recommend keeping it for a few hours because it tastes even better! 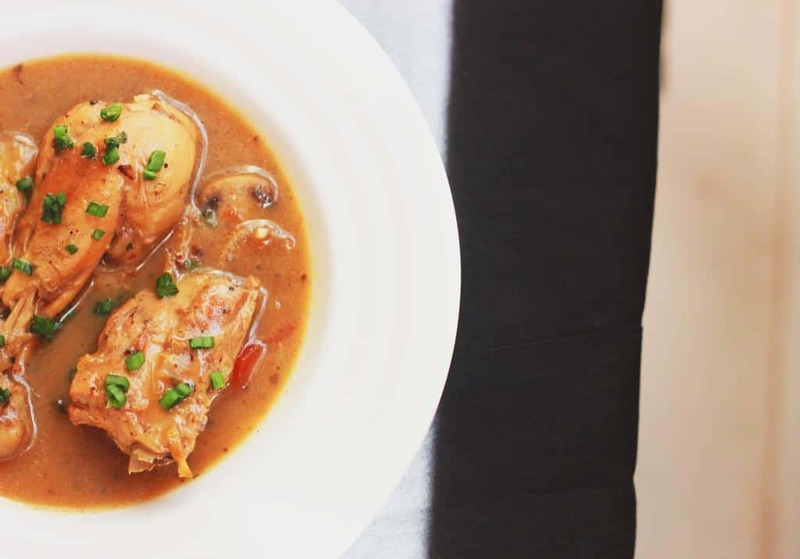 Comforting, steamy hot chicken stew recipe which is perfect for a family dinner or a hot one pot meal on it’s own. 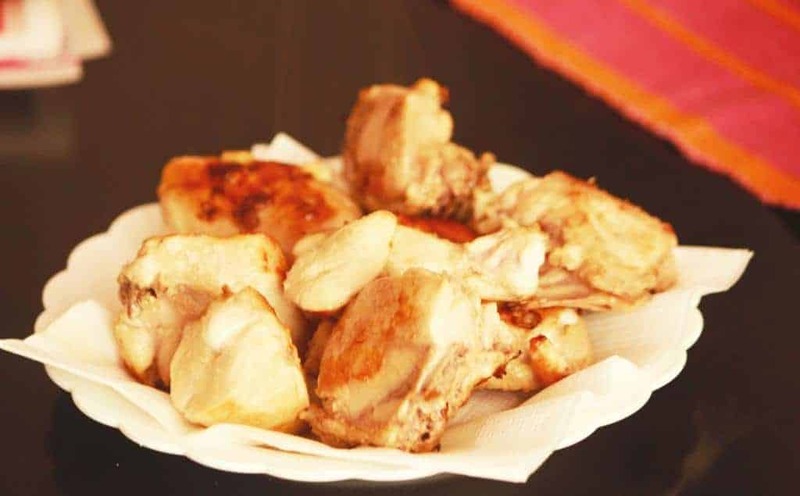 Rub ginger garlic paste and lemon juice over chicken and set aside to marinate for 15 minutes. Heat 1 tablespoon olive oil in a non stick pot and add the chicken pieces. Brown them on high flame for 2-3 minutes on either side. Remove from pan and set aside. Add 1/2 tablespoon oil to the same pan. Add the bayleaf, cinnamon, ginger, garlic and sliced onions. Its important to use the same pan because the browned bits of chicken stuck to the pan help make the wonderful sauce. Saute the onions for 10-15 minutes till golden brown. Add mushrooms and saute for 2-3 minutes. Add the carrots, radish and the chicken. Stir for a few minutes. Add the chicken stock, black pepper and salt. Cover and cook for 20-25 minutes. Taste to check for seasoning. Add the flour to water and mix till there are no lumps to make a slurry. Add the slurry to the pot and bring to a boil while stirring continuously. Simmer for 5-10 minutes. Let the stew sit for a few minutes before serving. It tastes even better if its been sitting for a few hours or overnight. Serve warm with bread or rice. Just tried this recipe and it was amazing! I really didn’t realize that I could cook and I’m feeling so satisfied after eating it. Looking forward to eating the leftovers tomorrow! The Stew looks delicious. I am going to try it right away. Love the new look and the pictures are amazing. Love the quality of the blog now! Please keep posting.